*【One Socket with 2*USB Outlets】The new Wifi smart socket is equipped with dual USB hole and 1 AC power outlet,which not only save money to buy power adapter but also meet customers&apos; need to recharge multiple devices at the same time.Isn&apos;t it more money-saving? *【Energy Monitoring & Timer/Countdown Function】It can track current and historical power usage for connected devices and effectively schedule your usage to save on your next electric bill,very convenient and practical.With the convenient timer function,the smart outlet plug can on/off automatically up to your mind.Furthermore,you can create customized schedules for your devices,set power on/off, saving time and enhancing safety. *【APP Remote control】Support APP to control AC output/timing/countdown,etc.You can turn on/off your household appliances with simple touch on the smart phone,enjoying peace of mind via monitoring home devices remotely. 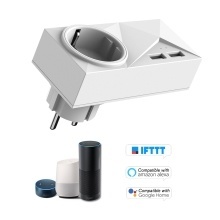 *【Voice Control】Perfect solution to control of hard-to-reach devices or electronics without manual ON/OFF switches.It can achieve voice control compatible with Amazon Alexa for Google Home/IFTTT,which can bring you a complete hands-free experience. *【Super Design】Made of PC material,safe to use.Elegant and tidy design will add fashionable atmosphere for your home.